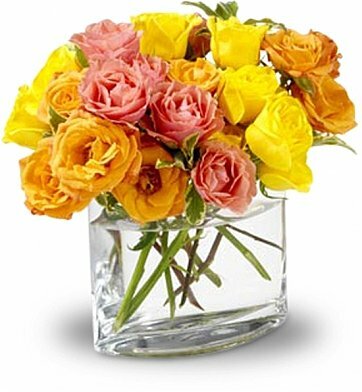 A sparkling clear vase will arrive filled with water and bursting with pink, orange, and yellow spray roses, complemented with variegated pittosporum. Makes a sweet, summery gift for birthdays, get well, or whenever a smile is needed! Measures approximately 10" x 9". if ordered by 3:00 pm EDT Saturday April 20th. Rose Sorbet Bouquet is a hand delivered gift. These gifts are delivered by one of our local design centers located throughout the United States and Canada. Same day delivery is available for most gifts when ordered before the cutoff time. The cutoff time for Rose Sorbet Bouquet is 12 PM in the recipient's time zone.